The second weekend of the 2017 World Rally Championship provided yet further evidence that it is one of the most open and unpredictable seasons in many years! 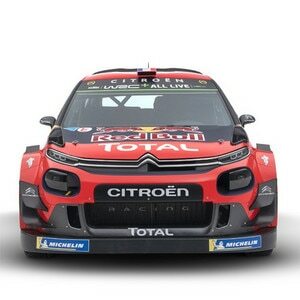 In Sweden, the Citroën Total Abu Dhabi WRT met some of its targets thanks to its young drivers, Craig Breen and Stéphane Lefebvre. Whilst not underestimating the scale of the challenge ahead, the team undoubtedly made progress and is heading in the right direction ahead of the first round on gravel. The rally got underway on Thursday evening with the Karlstad super special stage. However, all the crews were waiting until Friday morning before switching to maximum attack in the forests of the Värmland. The Citroën C3 WRCs were in impressive form at the start of the race, with Kris Meeke setting the second fastest time on SS2 and Craig Breen finishing third on SS3. At the mid-leg point, Kris was third overall whilst Craig was eighth, less than twenty seconds adrift of his team-mate. On the second run, Meeke had to contend with excessive wear on his Michelin X-Ice North 3 tyres and was unable to hang onto third place. Meanwhile, Breen struggled with the handling of his C3 WRC after damaging the front aero package when he hit a snow bank. He held onto eighth place, but dropped time to the drivers ahead. "We clearly still have work to do to make the most of our car's potential in certain conditions. 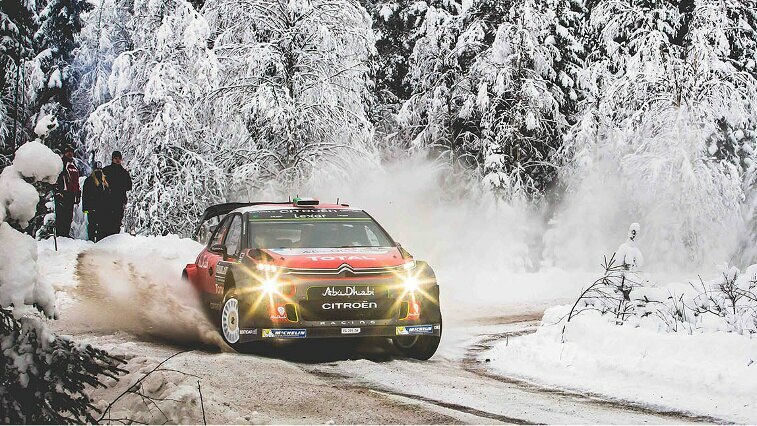 On this surface, we were fast on the first pass on the stages," noted Yves Matton, Citroën Racing Team Principal. "We still need to work out why our drivers were less comfortable on the second runs." Craig enjoyed a more positive day. Avoiding the previous day's mistakes, the Irishman profited in particular from the misfortune of other drivers to move up a few positions. As he returned to service and parc ferme in Torsby, he could be pleased to have ended day two in fifth overall. The rally concluded with a sprint finish on Sunday, with just three stages to complete. Craig Breen and Scott Martin looked to make sure of their result and therefore took no risks. They added a second fifth-place finish to the one secured in Monte-Carlo! Twelfth overall, Kris Meeke and Paul Nagle nonetheless scored two points as they claimed fourth place on the Power Stage. With both Citroën C3 WRCs making it to the finish, Citroën Total Abu Dhabi WRT added 16 points to its tally in the Manufacturers' World Championship. Having only contested Rally Sweden once before – in 2015 in a DS 3 R5 – Stéphane Lefebvre started this year's event as something of a rookie. In a 2011-2016 generation car, the Frenchman produced a convincing, assured performance. He devoted day one to learning about the roads and conditions, making a significant step forward in terms of performance on the second runs on the stages. On Saturday, he had to contend with a tough starting position in running second on the road and spent the morning sweeping fresh snow off the racing line. However, it didn't stop him from moving up to eighth place, a position he confirmed on Sunday. Without the pressure of having to score points for the Manufacturers' World Championship, Stéphane therefore made the most of the opportunity to improve on this unique surface. His performance will also do his confidence no harm before next month’s Rally Mexico (9-12 March), which he will be contesting in a C3 WRC. "We can take some satisfaction from having had perfect reliability this weekend," stressed Yves Matton. "Craig and Stéphane hit the targets we had set them, so they made a substantial contribution to the positive aspect of the weekend. Craig managed to show good speed at those points when he felt more comfortable in the car and adopt a more measured approach at other times, when necessary. Stéphane learned about managing a race like this in a wide variety of conditions. It's a positive result for him, considering his limited experience on snow." "It was a more mixed weekend for Kris. He had a few difficulties feeling entirely at ease in the car on the variety of road surfaces faced. In these conditions, it's not easy to develop your confidence," added the Citroën Racing Team Principal. "There's a good chance the situation will be different in Mexico, where the road surface is more consistent throughout the rally."